After extensive development, the new Timelines feature is available to test on Windows, and soon OSX. In the video above, I showcase one use case, using the AudioVisualBach example program which is included in the TWO download. The changes to TWO since the previous version are very extensive, besides Timelines, this version also includes a great amount of bugfixes and improvements. So do go ahead, click on “Downloads” above, and give it a try! Since the first Alpha release, I have been very busy adding features and fixing bugs, making this version 0.9.3 a much more mature build! • An entirely new Timeline Sequencer, for arranging saved states over time, and sequencing the gradual interpolation between them. For now this sequencer has a single lane for states. In upcoming releases, Record, Playback and Re-Arranging functionality will be integrated into additional sequencer lanes (these are the lanes seen at the bottom of the image below). Cut/Copy/Paste/Duplicate implemented for all elements where this makes sense. • Many improvements to the GUI. New Icons, and several usability improvements. – Global settings are now correctly stored and recalled on Windows 8 & 10. – Several bug-fixes and improvements were made to Recorder. – The rare occasional crashing should now have been fully fixed. – The Envelope controller now works correctly across operating systems. Existing installs can be updated using the “File->Check for Updates…” menu item. Please keep the bug-reports and feature requests coming, and in the meanwhile I will concentrate efforts to finish the development of the timeline sequencer features, which upon completion will mark the 1.0 version of TWO. For as long as it is in Alpha, TWO will be free to use. I hope that you find it to be a compelling tool! 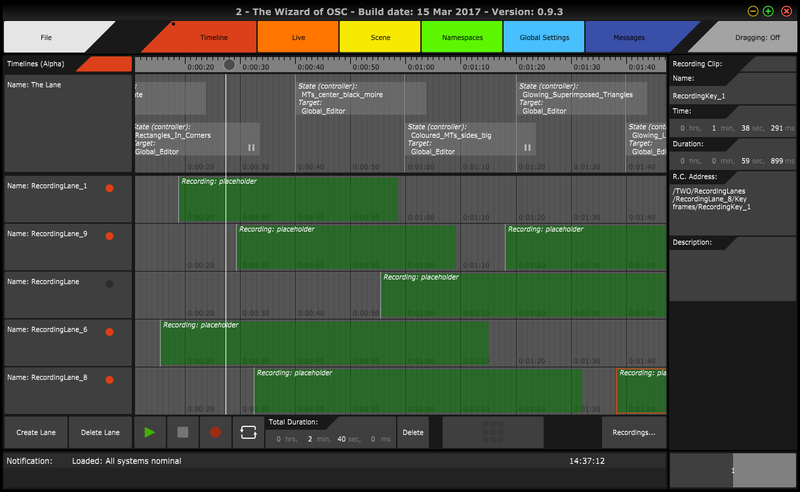 Finally, after years in development, The Wizard of OSC (TWO) is ready for a first public Alpha release! Version 0.9.2 Alpha is coming up, for Windows and OS X. TWO provides a set of tools which together allow the recording, replaying, and creative manipulation of digital media control signals (currently MIDI & Open Sound Control), be it for live sound, graphics, show control, or the Internet of Things. Its functionality is inspired by how live electronic musicians perform using a mixing desk and effects. Along with the Alpha, I have also created a small independent program that serves as a self-sufficient example of TWO in use, accompanied with a video explanation, as well as a manual explaining TWO’s purpose and features. For as long as it is in Alpha, TWO will be free to try and use. I hope that you find it to be a compelling tool! In return, I hope you share your bug reports, feedback and suggestions, on the TWO forum. I intend to iteratively improve on TWO, following your feedback, towards creating a rich, stable, final version for v1.0 release! So, head over to the Downloads page to grab the installer, for Windows and OS X! I was recently involved in a project with the Agalma Foundation, in which two pianists improvise live, and data from their playing and electrophysiology, is used to control live visual music projections. I was tasked with all software development for the live visuals, and The Wizard of OSC has played an indispensable part in connecting the vast data streams stemming from the performance to the live visuals projections. For the visuals, I used my open-source software Mother. You will see me behind the desk full of electronics, and can also catch a glimpse of a prototype version of The Wizard of OSC running on a touch-screen laptop. If you want to read more about the project with the Agalma Foundation, the Musica reportage goes into a bit more detail than this post. 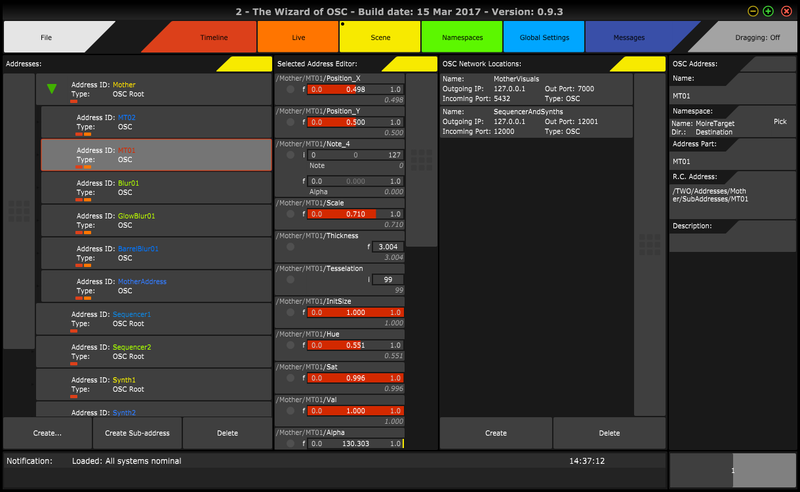 For now I’m just getting a website up and running, in anticipation of the first public Beta release of The Wizard of OSC (TWO). In the meanwhile, do subscribe to the newsletter at the bottom of this page, that way you’ll be sure to receive any news on TWO’s development!